The summer break at the workplace officially started. Teaching and its accompanying tasks are temporarily over. The past week has been more relaxing. My attention is all focused with my documentation project. Things are almost perfect not until my best friend at the workplace announced her unexpected resignation. I admit, I'm still battling the sadness of being left behind. The atmosphere at home was the opposite. 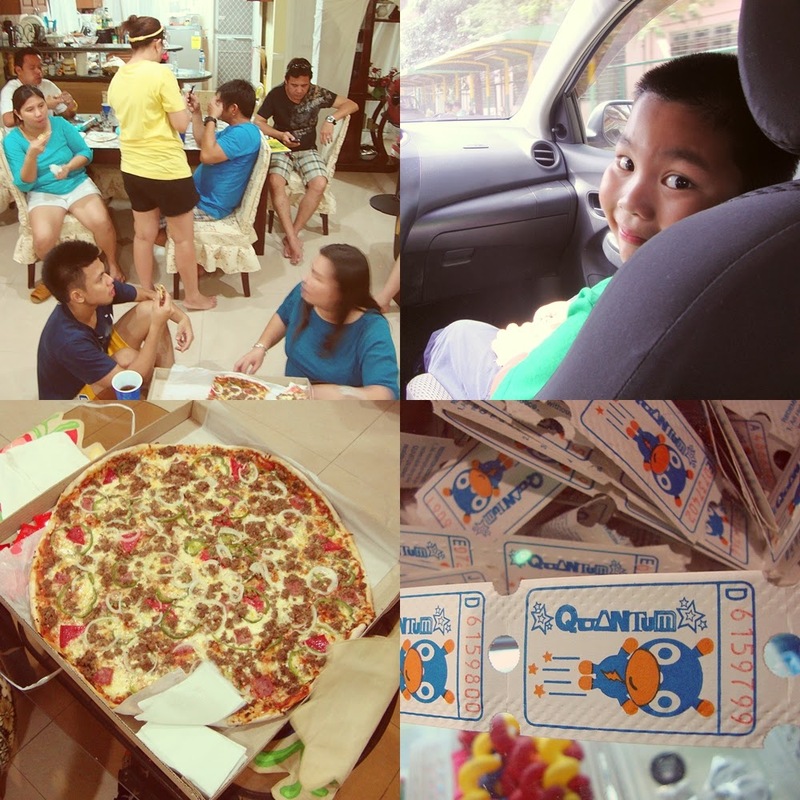 There was the unplanned get together with my cousins. We had a mini pizza party for Auntie A. See our humongous pizza below! :) Earlier that day, we had a mall date with the newest kid on the block. We the took healthiest kid ;) in the family to his happiest place. We spent the entire afternoon at Toy Kingdom and SM's Quantum. In the middle of the week, I spent the entire day shopping with another dear friend A. We went to the cheapest shopping mecca in Manila, 168 mall. I've been hearing nice things about Juana's Clothing Line. We visited several outlets and I was able to score three nice blouses. Best about everything, I spent less than Php 1,000. Count me now as one of the many loyal customers of Juana. 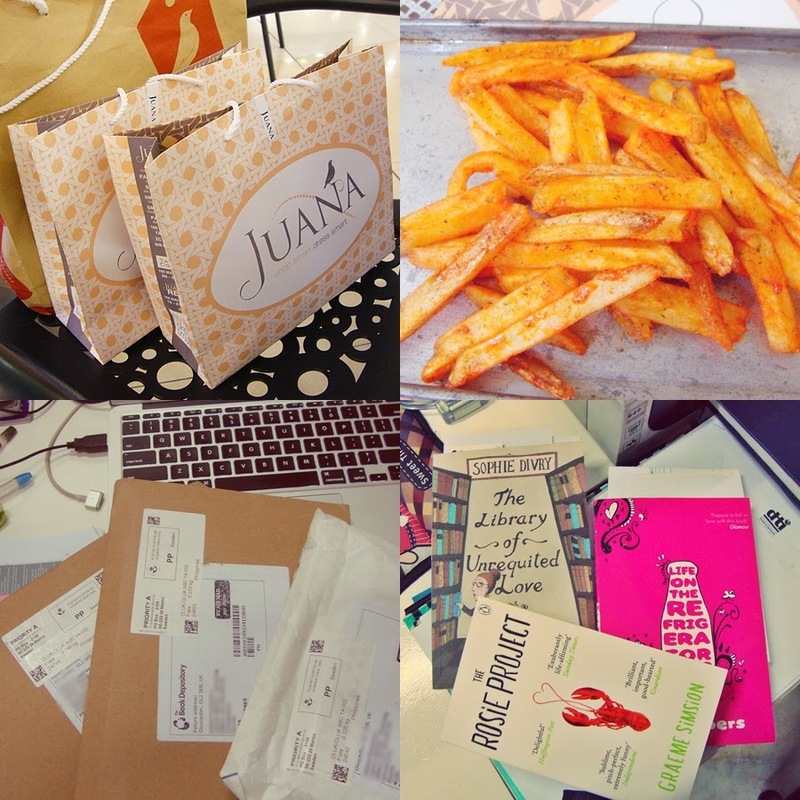 A misfit in the collage is the huge cut fries I had after a long day of shopping. I've been craving a lot of these for months. The last batch of Economics majors of our school uttered their farewells. Days before the actual graduation rites, our school has this unique send off ritual for all the candidates for graduation. I was able to witness their farewells from my working niche. I handled these kids for a number of semesters. Aside from feeling a bit sentimental, I really feel so old. Hahaha Where did all those years go? The sweetest cookies and cupcakes are my temporary happiness companions. Blame all the farewells and sadness lately. I just look happy but deep inside, I'm silently weeping. It will be my best friend's last day at work tomorrow. So last Friday, we went out for some katsu and coffee. 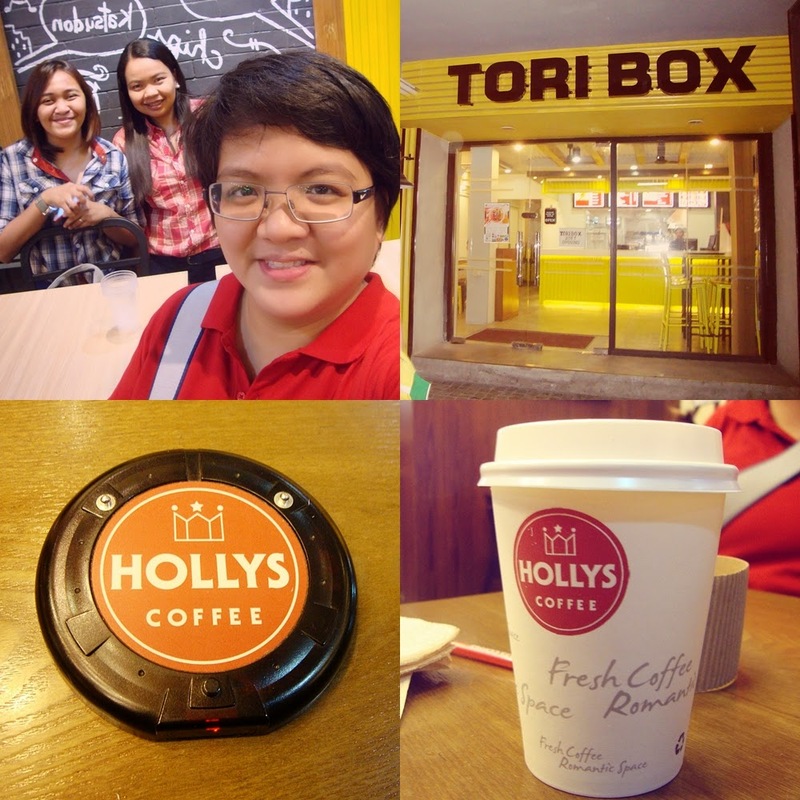 It was my first time to try Tori Box and Hollys Coffee. Dude, had it really been 9 years? That span of time was like starting elementary school at 7 years old and parting ways when we turned 16. All the more I feel so old and awakened. I really should start doing something. Thank you for all those beautiful years! Though this appears like a sad ending, I'm convincing myself that this is rather a new beginning. Wishing you all the best on your new home! This is one of those books I purchased because of the title that caught my attention. The Library of the Unrequited Love?! My hopeless romantic hormones were awakened. Having a “Library” in the title meant a book that deals with books. There’s “Love” which further tickled my need for a possible romantic read. More importantly, there’s “Unrequited,” which encapsulated everything. Three checks, I was convinced that the book is meant for me. The Library of the Unrequited Love relates or better yet, rants the life of a Librarian. The entire story was presented in the second person because the Librarian was relating her hang-ups to an unidentified reader locked in her section the entire night. The story is a narration of the single and solitary life of an old female Librarian. Much of her rants focused on her work and later translated to her entire life. She complains being assigned in the most undesirable section of the Library. In the midst of her emotional outpour, she presents a man who silently captured her heart. The entire book was presented in less than 100 pages. It could almost qualify for a short story. I would have wanted a longer story line. However, some reviewers thought that lengthening the story might make it too dragging. If I will be reading a continuous downpour of rants and sadness, I have to agree to some extent. One thing I appreciate about the book is the long litany about the works and life of a Librarian. While most people belittle this profession, the lead character proved that being a Librarian is way challenging than what other people perceive. More than shelving and arranging books, they are information resource specialists. They serve as the best persons who possess the knowledge and skills in organizing the vast and growing body of information around us. Overall, I would like to give the book 3 out 5 stars. I highly recommend it to all the book lovers, hopeless romantics, and anyone looking for a short, witty and entertaining read this summer. I originally planned to write something special for my 100th Beautiful Sunday. However, something sad happened at the workplace. In the middle of the week, someone announced her unexpected farewell. Truth is, there are two great people leaving the workplace. One is my superior in teaching. The other is a best friend I grew up with for the last NINE YEARS. Obviously, I'm more affected with the surprise departure of my very best friend. The thought that the next months meant being alone is making me cry. I'm trying to condition myself that farewells are not really endings. It symbolizes new beginnings I have to face. I'll talk about this in another post. For now, let me continue with my regular Sunday ritual. Oreo Milkshake at the workplace's cafe - This has been offered by the workplace's cafe for quite a number of years. It was only last Monday when I managed to purchase one. At Php 75, this can serve as a great companion on those sleepy, boring and lonely afternoons at work. Better to some extent because it's way cheaper than my favorite Java Chip from Starbucks. And yes, I have to emphasize being lonely... The next months at workplace requires a lot of tolerance and endurance for sadness. The school's ghost town atmosphere during the summer break is contributing to the melancholy mood. If I may borrow John Green's words from the The Fault in our Stars, that's the problem with pain.. it demands to be felt. Japanese crackers and peanuts - I don't exactly know the name of this cute Japanese snack. This is a regular freebie at the workplace courtesy of the boss. My colleagues don't like the mixture of flavors which is overpowered by saltiness. My weird taste buds however like it. 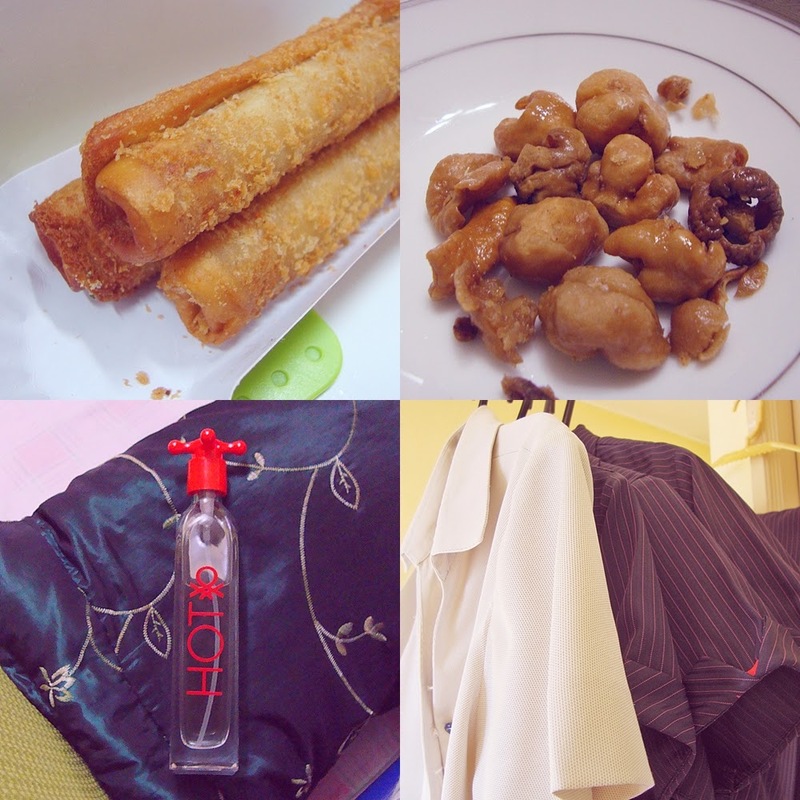 Siomai and bits of chili - I cannot count how many times I've included this comfort food in my Beautiful Sunday series. Pardon the overexposure, but this never fails to relieve my exhausted self. Coke and Potato Chips - Another great companion while I'm checking papers and encoding the grades of my students. Unhealthy? Yes but this never fails to kill my sleepy hormones. Rare words of gratitude and appreciation - This is happiness! When one of your students thought of sending you short yet meaningful words of gratitude. The other written thank you note was written on the examination paper. This made me laugh for a while because of all the twitter handles. But seriously, I'm likewise thankful for another stressful yet fulfilling semester. Jollibee is returning their classic spoon and fork?! - Is this for real? Only kids at my age can understand and relate with Jollibee's classic spoon and fork. :) This makes eating the classic sweet spaghetti more fun. I never imagined a Catholic nun competing for the much coveted title from The Voice - Italy. Way to go Sr. Cristina!! Lastly, here's a beautiful opportunity for everyone who loves Victoria's Secret products. Visit Shayne of Queen of all You See for a chance to win a surprise beauty package. In the middle of a stressful work week, I received a very sad news. 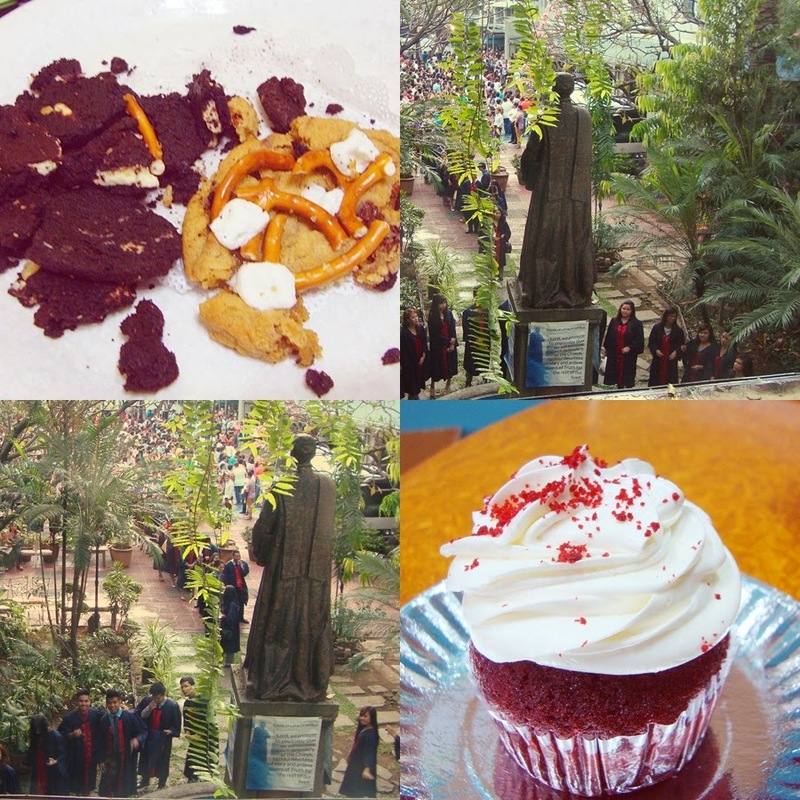 Setting aside the drama (hahaha), let me share (as always and forever) the few good and beautiful things that made my week. A Hand of Bananas : Dad's First Harvest - A few years ago, my Auntie T acquired a parcel of land near our home. Dad embraced the role of the caretaker. Since Auntie T has no definite plans for the property, Dad took advantage of the opportunity to raise a few crops. We love that Dad planted something edible, useful and organic. Yes, organic because Dad didn't use a drop of those chemical based fertilizers. Goldilocks' Mocha Birthday Cake - Yay for childhood memories! All children in the family grew up with this classic Mocha cake. There was never a birthday without Goldilock's Mocha Cake. We love the brown icing, chiffon bread and those frosted sugar flowers we have to compete for. Cheesy Beef Kebab and Java rice from Kebabers - Not in the photo is the chili garlic dip that complements all the grease and cheese. I had this after a long Friday which started from braving the crowds of the mall wide sale in the morning, reporting for work in the afternoon and attending my classes in the evening. Paotsin! - I was so late to discover this very cheap yet tasty dumpling and hainanese rice. After my lone yet tiring Saturday class, I was in search for a great dinner. I don't feel like taking Mc Donald's or Taco Bell. I was likewise looking for budget friendly meals then. Like, less than Php 100? I found a stall of Paotsin and decided to give it a try. The total damage for this great meal, only Php 50. Breakfast Meal from Pancake House - I had breakfast for lunch. Whoever said this is not possible? :) In the middle of the week, I took a leave from work. I have to take advantage of the limited 20% price reduction of all items in a mall wide sale. I have to replace a very expensive equipment at home. I figured out that the mall wide sale is the best time to purchase. True enough, I was able to save thousands of pesos. But after waking up early and enduring the long lines, I felt the need to treat myself with this belly heavy meal. Sinigang na Baboy - For the benefit of my non-Filipino blog friends, this is pork, vegetables in tamarind soup. This is a common household meal here but it's rare that I enjoy it at home. Another cheesy rolls - I'm loving this food stall at the workplace's canteen. This was the same stall that gives me my weekly dose of greasy fries and hash brown. Pardon the ewww for some ... Chicharon Bituka (Crunchy Pig Intestines) - This is so bad for my health. It has all sorts of bad fat and salt. But I guess, consuming this once a year is not really bad. And finally, something away from these foodie posts.. Hot from Benetton - The mall wide sale was the culprit! How can I refuse the 20% reduction? A few of my friends and cousins always say that Hot is a nice perfume. I don't indulge in perfume shopping because I'm quite allergic to scents. Some perfume make me dizzy, sleepy and worst, cause me headache. But this particular perfume didn't give me any form of irritation. I guess I found a new and reliable companion now. Well, it wasn't really a "wedding dress." It was actually the title of a Korean film. A fellow blogger recommended this movie. As one of those Filipinos obsessed with Korean drama series, I searched for possible clips and fragments in You Tube. Surprisingly, someone uploaded a full version. I know, this is an illegal copy. But how can I resist? :) While the movie is still available for viewing, please please please watch it! You will never regret it. Don't forget your box of tissues. I've been spending more time with clingy friend, CC lately. :) Over the past week, CC was more than willing to wait for me. On one of those weeknights, we decided to try this restaurant. 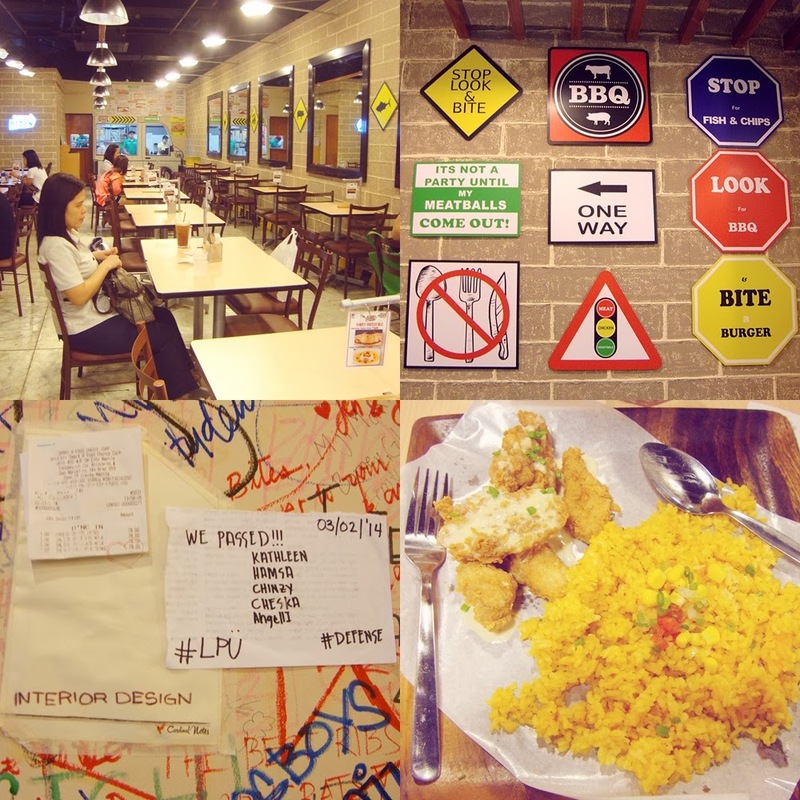 My initial impression, the restaurant looks like a fusion of Army Navy and Yellow Cab. I even thought that it might be a sister company. This is something I have yet to validate. I wanted to try their angus and wagyu burger. However, budget considerations tell me that I'm only good for their rice meals. Hence, we ended with this order. Maybe my first visit is not sufficient to rate the restaurant. I should try a couple of times more. But at this point, allow me to rate the restaurant with my limited experience. Food - I ordered their chicken fillet paired with java rice. Everything was just fine. Nothing really unique and special with the meal. To compensate, all dishes are cooked upon order. Hence, freshness and quality are ensured. Waiting time for orders is minimal and tolerable. As for choices and variety, I can give an above average rating for the restaurant. 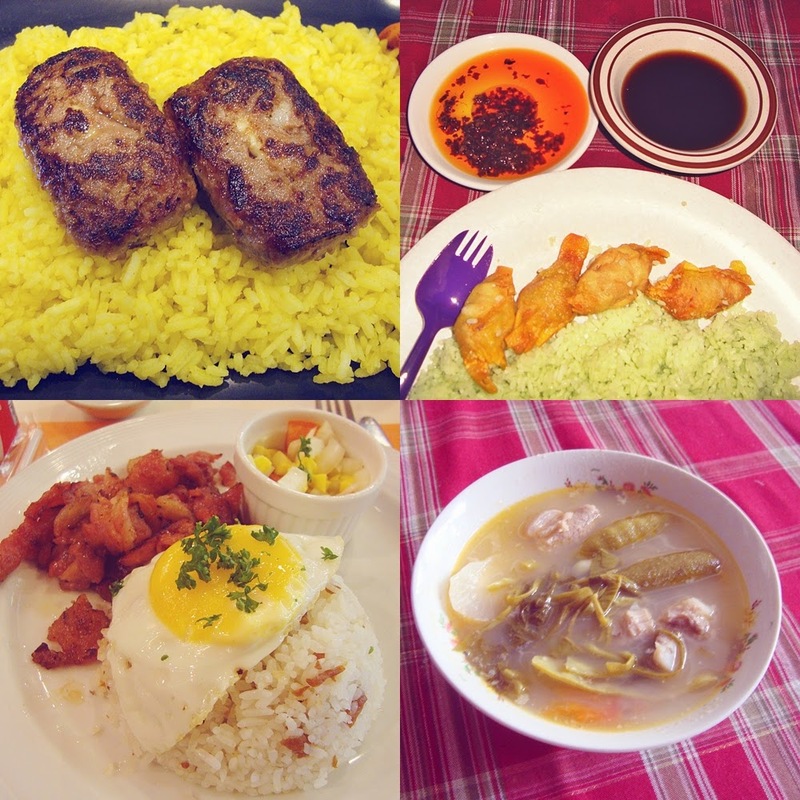 They have rice meals, pasta, burgers, side dishes, deserts, and beverages to choose from. The rice meal I had may not be that impressive. But their houseblend ice tea was surely one of the best I ever tasted. It has the right blend of lemon, not too sweet or sour. Service - This is where the restaurant excels. All the service crew were attentive and responsive to the needs of the diners. Orders are likewise cooked fresh and fast. Place - The creative interiors is for the win! Cleanliness is another aspect where the restaurant excels. I noticed that all tables are clean and dry. Far from those stained and sticky tables in food courts and fast food chains. Should I give it another try? At this point, yes. I have yet to try their burger meals. Hopefully, their burgers are way better and special than the rice meal we ordered. For more information about 8 Street Bites, please check out their social media accounts. As promised in the previous post, I will be sharing another shopping and shipping experience. This time, the experience is about LL Bean and Pobox.Ph. LL Bean is an American based company founded in 1912 by Leon Leonwood Bean. Hence, the company name. LL Bean is known for producing apparel and reliable outdoor equipment. 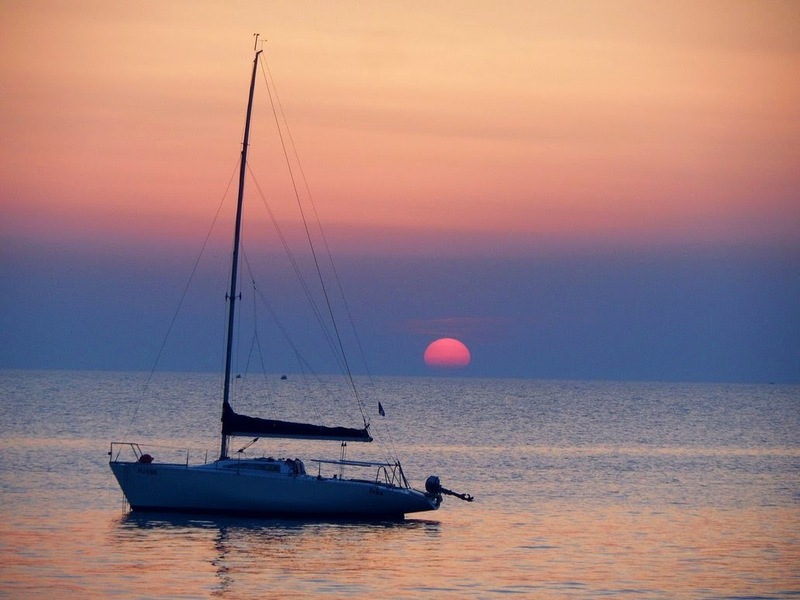 It started as a one-man business in Maine and later expanded with global operations. As of date, the company is still maintaining its main production site and corporate headquarters in Maine. LL Bean also operates in Japan. I discovered this when I was searching for Instagram users with LL Bean bags. My search results were dominated by Japanese women sporting their own monogrammed tote. I actually thought of ordering online in Japan. Since the country is nearer, the bag will arrive sooner. Unfortunately, I cannot navigate the page that was presented in full Japanese characters. 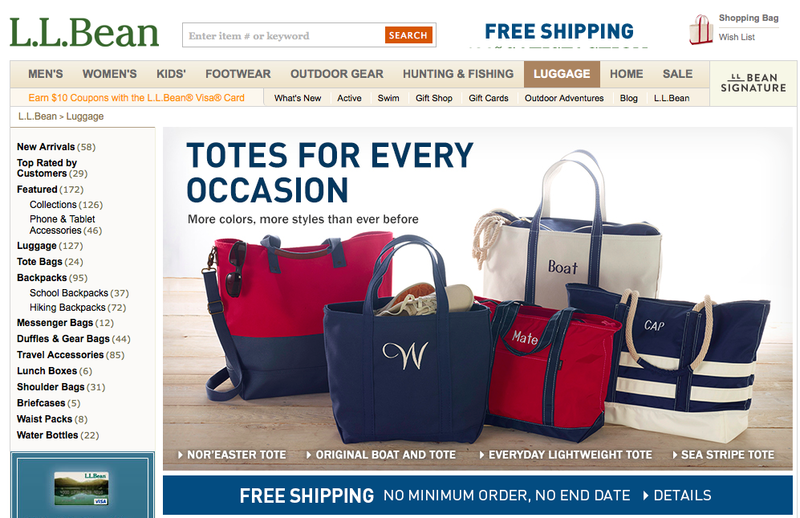 Among the products offered by LL Bean, I was obviously attracted to their line of boat and tote bags. You can check their boat and tote bags here. Ordering at LL Bean was so easy. It follows the typical procedure of shopping sites, add the item in your bag, check out and pay. The process will consume additional steps if you prefer customisation such as monogramming, zippers and additional pockets. I was quite fortunate when I purchased the bag because there was 10% price reduction on all items. Yay! During the online purchase, I encountered a minor problem that was immediately resolved by the very smart and reliable customer service officer. Turns out, LL Bean's system does not accept Philippine based Paypal accounts for orders to be delivered to a US address. Simply to say, orders paid using a Philippine based Paypal account should be directly shipped to the Philippines. This will therefore prevent me from availing the services of Pobox.Ph and other cargo forwarding companies. This further meant that I have to pay expensive shipping fees and questionable custom taxes. Fortunately, LL Bean's customer service officer offered a smart alternative. He suggested, I purchase an e-gift card using my Paypal account. With this, I was able to escape the system's restriction of shipping an item to a US address while paying using a Philippine based account. Thank you Sir! I forgot your name but you were so smart and efficient. Everything was resolved by a very convenient online chat mechanism. LL Bean offers free shipping in US, regardless of amount of purchased. This is something Lands' End doesn't offer. In addition to this, LL Bean maintains its own tracking facility. All orders, regardless of size, weight and price, are entitled for tracking. On the contrary, Lands' End tracking facility is redirected to UPS' site. After a few days, my first LL Bean tote arrived in Pobox.Ph's US address. I thought everything would run smoothly. 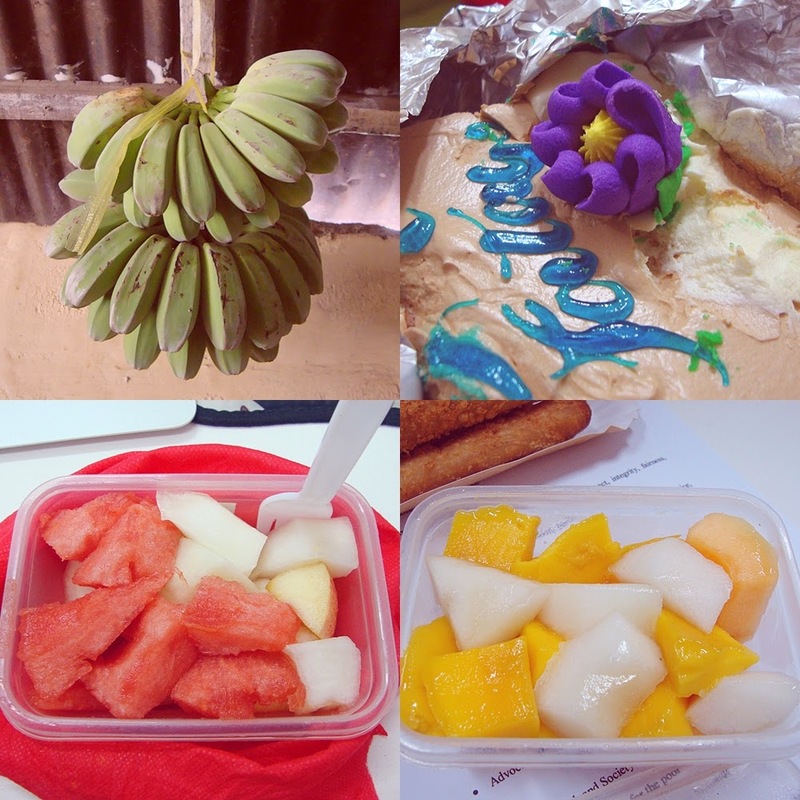 It was my first time to try Pobox.Ph. They were able to deliver my bag with minor problems that were likewise eventually resolved. Pobox.Ph's process is quite different from Johnny Air. Johnny Air only requires an email to inform them of the item that is yet to arrive in their US office. Pobox.Ph requires signing up for a personal account. At first, I felt that Pobox.Ph's system is more organised and secured. A personal account with login name and password is more secured than a notification email. Pobox.Ph claims that the status of my package will be posted in my personal account. Unfortunately, I have to send follow up emails for posted updates. The entire waiting period from Pobox.Ph entailed sending repeating follow up emails. When I paid the shipping fees, it took them days and as always, a follow up email to confirm and update. Despite the slow response of Pobox.Ph, they were able to deliver my package. They claim that they deliver within 5 weeks. True enough, they fulfilled their promise. The box used by Pobox.Ph was of the same size with my Lands' End package. I paid Php 1,386 ($ 30) for this size. You can see Pobox.Ph's rates here. 1. They have predetermined fees, dependent on the size of the box that will fit your package. Hence, no surprising fees when your package arrives. 2. They charge cheaper as compared to Johnny Air. However, Pobox.Ph uses cargo shipping. In effect, the lower fees meant longer waiting period. In my case, 5 weeks. 3. Since they ship via cargo, weight is not a major issue. Rate remains the same as long as your items fit the designated box. This gives me an idea that for heavy items, Pobox.Ph seem to be the better option. However, please note that they have additional fees for special products such as electronic gadgets. You can check the terms and conditions here. 4. The shipping fee is inclusive of door-to-door delivery. Package arrives to your doorstep, unlike Johnny Air where you have to pick up either in Makati or Megamall. 5. All packages immediately come with an insurance provision. You can read about it here. Johnny Air claims to offer but when I checked my receipt, there was a written disclaimer that my item was not covered. 6. It maybe a minor thing but my package was physically safe and secured with Pobox.Ph. As you can see from the photo, the box was enclosed in a plastic wrap. This was way better than my box from Johnny Air, which was half-way opened. LL Bean placed my order in a sealed plastic. It was fine because the bag is too strong and hard to be deformed. Anyway, Pobox.Ph did their job in shipping and handling. Without the plastic and papers, look how tiny is my bag for the box. Some of you might be interested to know the actual size of the box. You can check the details here. But if I will personally describe it, the box can almost fit a double burner gas stove. This smallest LL Bean tote can fit a 1.5 liter water bottle, huge paperback, foldable umbrella, big wallet and kikay kit. It still has spaces for my mobile phone and coin purse. One of the few reasons why I love LL Bean. This gave me a break from all the Made in China items. :) I learned from their website that all bags are still produced in Maine. 1. LL Bean is the best in Customer Service! They provide this online chat mechanism (like Yahoo Messenger) where you can be assisted by a Customer Service Office during your purchase. 2. They have a very good tracking facility. Unlike Lands' End who is depending on UPS' services. 3. They offer FREE SHIPPING to US regardless of the amount purchased. If you have kind relatives residing in US, you can take advantage of this offer. If not, you can consider availing the services of cargo forwarding companies or pay the $ 20 direct shipping fee to the Philippines. 4. Lands' End canvas bag may win the aesthetics but when originality is considered, LL Bean owns it. LL Bean was the first to create this classic boat and tote bag. 1. If you want cheaper shipping fees from cargo forwarding companies, Pobox.Ph can serve as your alternative to Johnny Air. 2. The waiting period is the main disadvantage of using Pobox.Ph. Since the company is using cargo shipping, expect a minimum waiting time of 5 weeks. 3. If you are buying heavy and bulky items, it might be best to use Pobox.Ph. You will end up paying cheaper fees because of the fixed and predetermined rates for boxes. PS Anyone interested to own an LL Bean Tote? Please email me :) maybe we can order together and share the shipping fees. Late last week, I received this box of goodies. Thanks to my dearest college kiddies, Gardenia girls: M, D and I. :) It was my first time to encounter this brand. Upon further internet research, I learned that Occubite originated from Malaysia. The company later expanded operations in nearby Asian countries such as Thailand, Indonesia and Philippines. As of date, their first and only branch in the Philippines is situated in Robinsons Ermita. I love muffins! But what really attracted me to Occubite was the unique and cute names of their muffins. :) A few are Dark Knight, Black Eye Peace, Katy Berry, Planet of Ape, Eagle Eye, and Megan Floss. As I discovered more about Occubite, I was led to some cute and interesting facts. The name of the brand is too cute to begin with. The brand name was derived from the words, Occupy and Bite. The mission and vision of the company also caught my attention. As someone who works for Corporate Planning, I can give their Mission and Vision, 5 out of 5 stars. It's easy to remember, direct to the point, realistic and not too ambitious. I also have to recognize the fact that not all companies include the welfare employees in their mission or vision. I received a six piece box set, which I shared to a few friends. The muffin with the rice krispies (I guess). I usually prefer moist brownies or cupcakes. I would have disliked Occubite's version. For some reason, I actually like their dry yet soft and fluffy bread. This has to be my favorite. The muffin with bits of Oreo cookies. As someone who is not a great fan of chocolates, I prefer their buttery muffin. Overall, I like Occubite's muffins. I prefer their buttery muffin though. I managed to taste a few of their chocolate variants, which I find perfectly fine. It's not too sweet or bland either. The level of sweetness was enough. To know more about Occubite visit their corporate website here or their Philippine Facebook Fanpage. Two more weeks, I will be able to eliminate one major workload. Teaching will be over and like I always say here, I can finally focus on my documentation project. Speaking of which, I received the deadliest deadline this week. I need to get things done before May starts. I have less than a month to complete everything. If only I can further discuss the requirements, I need all the inspiration, motivation, hardwork, energy, and brain cells to accomplish everything. 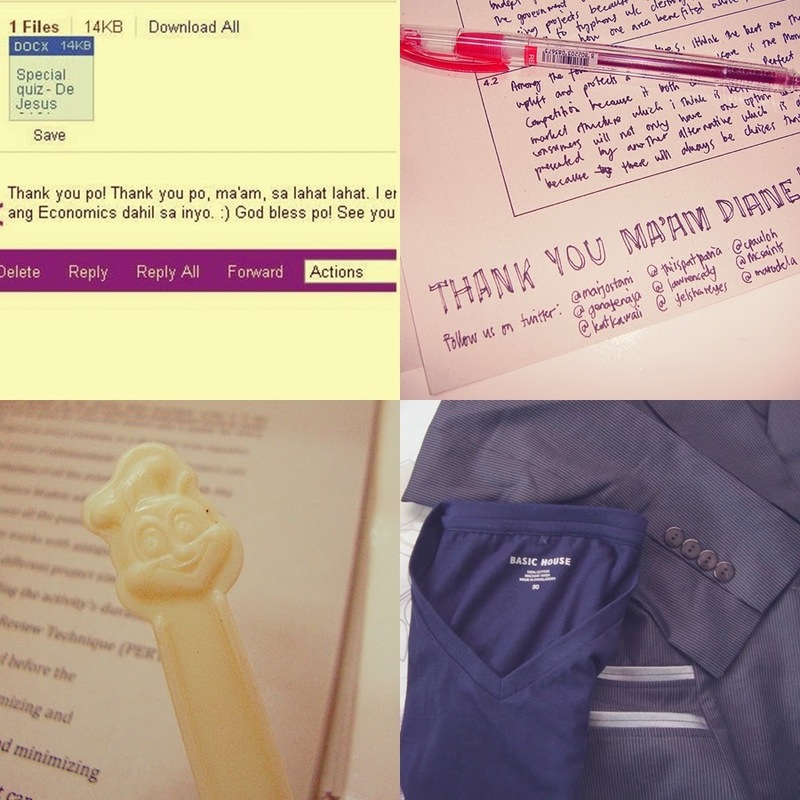 Setting aside the serious side of my life, let me share the few good things that made my week. Arm Candy! - Thanks to my friend A who works near SM Aura. I've been wanting to get this monogram bangle from Alex and Ani. It was always out of stock on the few times I visited their branch. I even left my number in their reservation list. Months passed, I never received any notification from any of their staff. Good thing, my friend Anne made the initiative to check. My two favorite fruit boxes - Yay for homegrown mangoes! Paired it with slices of watermelon, mangosteen and melon. 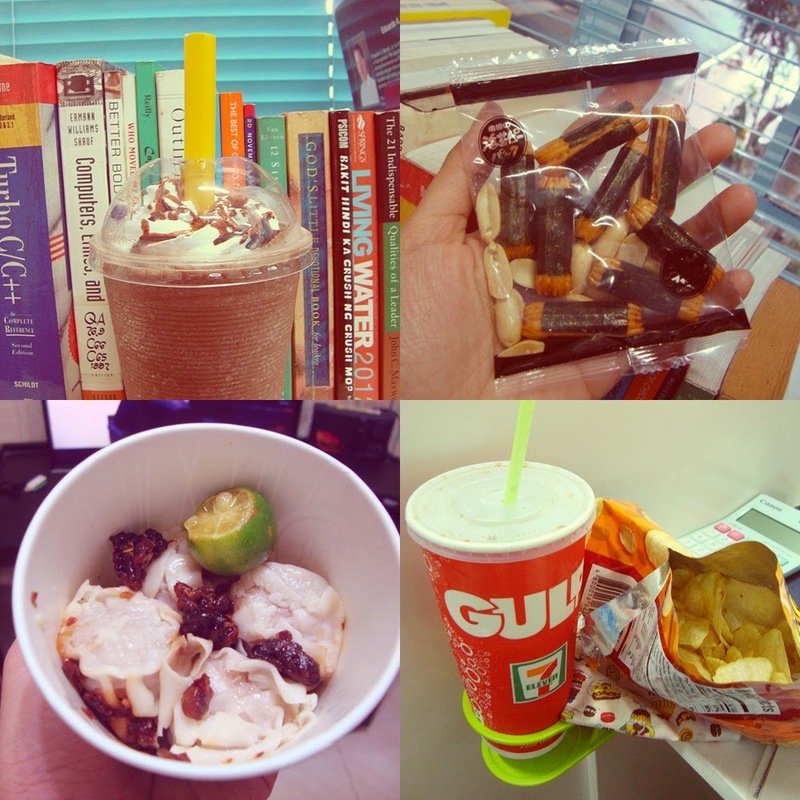 Say hello to my weekly dose of unhealthy food intakes! Cheese Sticks - This is another childhood and forever favorite snack. The grease and the melted cheese can suddenly take away those sleepy afternoons at work. 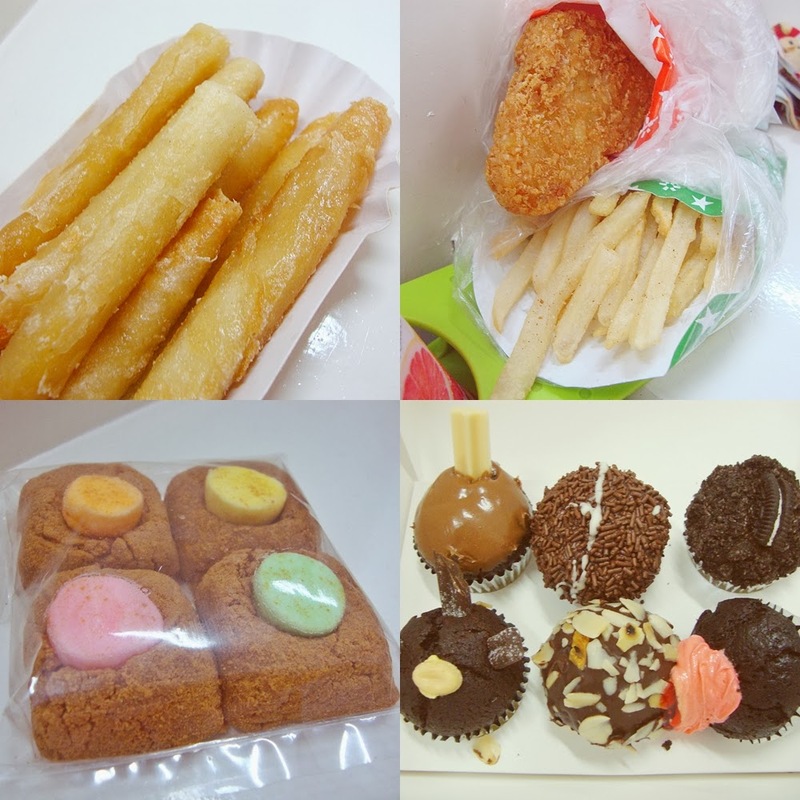 Hash Brown and French Fries - Yes to another set of happy greasy snacks! A box of muffins - My group of kiddie advisees gave me this as a thank you gift. Dearest Gardenia Girls, it was great working with you for two years. Good luck on your new endeavors after graduation. Auntie Anne's Pretzel - Oh dear friend CC! All the weight I gained this week should be blamed on you. We've been eating at Auntie Anne's for two weeknights. 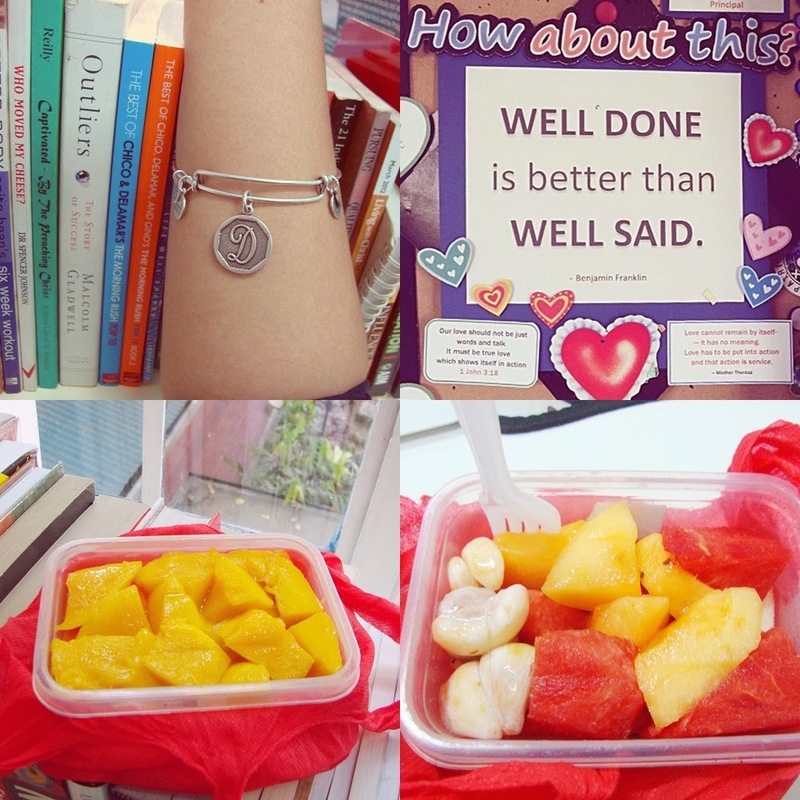 I love the almond pretzel, cheese dip and the lemonade to balance the sweetness. Mrs. Fields' Cookies - They finally have a branch at Gateway's Food Court. As soon as I saw their stall, I took home three variants. Among the three, I love the salted caramel the most. 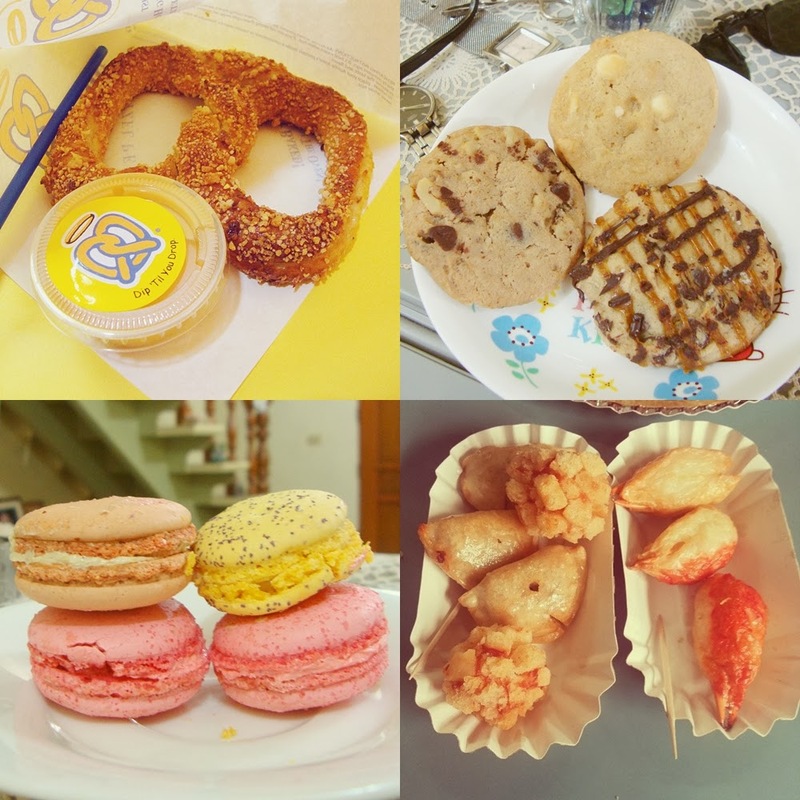 French Macarons from French Baker - Sweetness overload! If you want to make me happy, get me a box or a dozen. Hahaha Although I have yet to taste an authentic french macaron from Laduree. CC and I found a new dining place. I have yet to blog the entire experience. Let's reserve that on another post :) The interiors of this restaurant got us interested. It was like a fusion of Army Navy and Yellow Cab. We tried their rice meals, perfect after a long day at work. We want to stuff ourselves with food only to discover that there's really nothing special and spectacular. To compensate, they have the best service crew and creative interiors. The graffiti board particularly caught our attention. A group of college kids from another school shared their happiness after passing the thesis defense. Congrats kiddies! In the Philippines, March to May is the period of graduation. Hence, this is the season where most college kids are finally relieved from their major endeavor. A few weeks ago, I needed to drop by the Post Office to claim an important parcel. I have been a silent admirer of the Philippine Postal Corporation's neoclassical architecture since I was 10 years old. It started when I became a member of the school's Philatelist Club. As part of our exposure trip, we were given a tour and orientation about the national organisation for stamp collectors. Fast forward now, it took me a decade to see this magnificent building again. My workplace is a few blocks away from the Philippine Postal Corporation. Hence, everyday meant seeing this rare historical site. I've wanted to take photos of the building but for some reason, it took me years to finally do it. Most photos were taken outside the premises of the building. I failed to take photos of the internal structure because there was an ongoing event. Let that become my personal mission on my next visit. My not-so-perfect shot of the facade. The arriving passenger jeepney appears like an obstruction but I actually like it that way. It makes the photo more Filipino. A brief history of the Philippine Postal Corporation is found on the entrance. I have to mention that my Lolo (grandpa) is part of the corporation's history. According to Nanay, Lolo used to work here until he reached his retirement age. I thought that these towering columns were called as Doric. Turns out, this type of design is called Ionic. I learned that there are three types of columns namely, Ionic, Doric and Corinthian. You can learn more about the neoclassical columns here. I'm happy that even with the lesser revenue brought about by the convenience of email and shipping companies, the structure is still well maintained. The patterns of the floor tiles I can't understand haha but I learned to appreciate. This is classic elegance in architecture. The intricate details of the door's cornice is something you don't often encounter. This is rarely found in modern buildings. The floating lamp post complemented the overall neoclassical look. Except for the minor stains, everything is well maintained. If you have a chance to visit Manila, please include the Philippine Postal Corporation in your itinerary. Why not consider sending letters the old fashioned way? :) I also have to say that the employees of the Philippine Postal Corporation are way different from the stereotyped image of government employees. In the few times I need to do business with them, I experienced great and fast customer service. This is despite the fact that the most service areas are not equipped with air-conditioning units.